With Single-Use Fitler Capsules and technology on the rise, ErtelAlsop’s new MicrCap Laboratory Cabinet has been created to simplify filtration and separation trials for research and development, as well as, process development laboratories. This attractive and well organized cabinet easily stores the Single-Use filters you require. 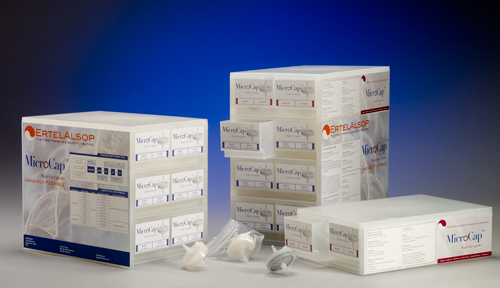 The MicroCap™ suite of Single-Use Fitler Capsules provide a uniquely flexible line of disposable depth filter products designed for optimizing and developing processes during scale-up and scale-down studies. The MicroCap Single-Use Capsule enables quick and efficient determination of appropriate media grades in providing the best filtration performance as well as required filtration area to meet process volumes. Each MicroCap Laboratory Cabinet is supplied with forty-eight MicroCap Single-Use Fitler Capsules in twelve different grades ranging from a nominal 15 micron to 0.2 micron. All supplied capsules contain 23 cm2 (3.6 in2) of filtration area per capsule. These easy to use capsules allow users to test a comprehensive range of depth filter media and efficiently determine the right solution for their process needs. The MicroCap Laboratory Cabinet incorporates ErtelAlsop’s MicroCap MC1 capsules each containing our high performance XL Series , and select Micro-Media series grades of depth filter media to provide the optimum balance of dirt holding capacity and throughput. Containing a high performance grade of diatomaceous earth filter aid, coupled with a strong positive zeta potential, ErtelAlsop’s XL Series capsules provide superior contaminant retention. The XL Series of depth filter media exhibits 2-5 times the throughput of competitive media while maintaining equivalent or better product clarity. As with all ErtelAlsop depth filter products the MicroCap capsules provide performance consistency and lot to lot traceability all in an easy-to-use format. All MicroCap capsules are batch tested in order to meet all quality requirements and meet all applicable USP requirements including the Class VI Plastics. The MicroCap series of single-use capsules contain six easily scalable sizes of capsules. Additionally each of these capsules readily scale to ErtelAlsop’s 12” and 16” diameter lenticular depth filter modules.